Allison has done it again! 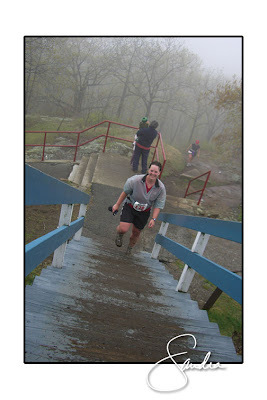 She challenged herself to run the 7 Sisters Trail Run, a 12-mile race along the 7 Sisters Ridge and to the top of Mt. Skinner. She completed it--which is the first accomplishment--and did it in great time. Brett and I visited the top of Mt. Skinner this morning to cheer her on. She looked great and was in good spirits. The climb up the stairs to the Skinner House was a feat in itself. Many runners asked where the escalator was:) As you can see the day was a foggy and wet. The temperature was around 50-55--nice and cool for running--but the moisture made the trails a bit slick. If you're a little crazy (sorry Allison:) and looking to really challenge yourself, try a trail run. It's quite amazing. Way to go Allison and all the other runners!